Last Saturday, I held my annual Lunar New Year Celebration at my house. 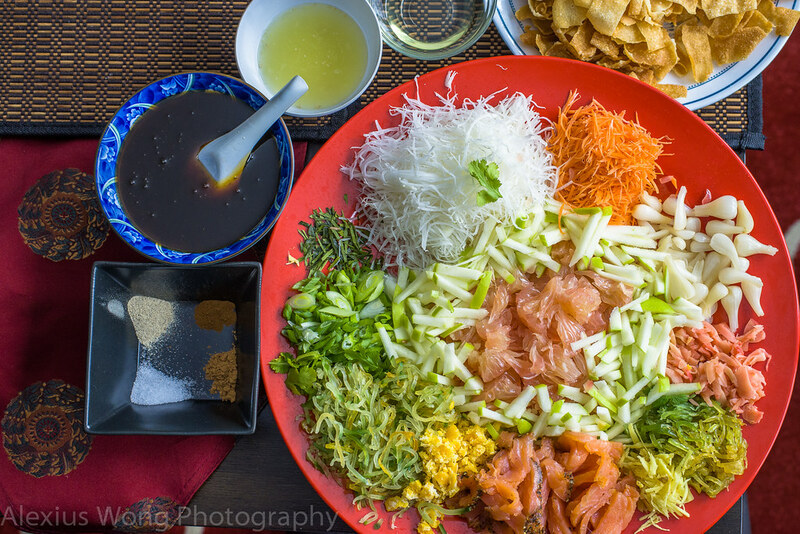 A prominent dish served on this occasion is a raw fish salad called Yee Sang. NPR had found my past postings (read blog) on this unique Southeast Asian tradition and they inquired if I knew anyone holding such custom. So, I invited the producer over, and here is the audio broadcast, along with a few photos. Hope you can feel the joy and festive mood when “tossing” this salad high in the air for good fortune in the year. Happy Year of the Monkey. How lovely that they approached you! Happy Year of the Monkey. Thank you for the complement and wishes. This is outstanding!!! I am going to share this. Thanks for sharing with us. The Chinese Malaysians who migrated to Australia celebrate Chinese New Year with this mandatory dish Yee Sang. The Malaysian restaurants have this dish on their menu for the two weeks of celebration of the lunar new year. For those who are squeamish about eating raw fish, smoked salmon or cooked squids can be used instead. It is getting popular in Australia even among non Malaysians. Thank you for your comments, and you always say, Mummy’s version of this dish is the best.